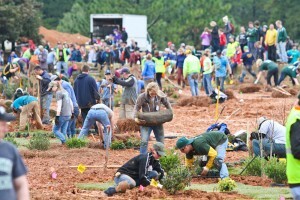 In its 39th year, the Professional Landcare Network (PLANET) Student Career Days drew 800 students to North Carolina State University in Raleigh, N.C., last week. Sixty-five teams, including three National FFA Organization high school teams, participated in 27 individual and team competitions. The events included, among others, tree climbing, hardscape installation, wood construction, plant identification, sales presentation, exterior/interior design, irrigation troubleshooting, skid-steer, 3D exterior landscape design, personnel management and small engine repair. Awards were given to the top-placing students, called “Superstars,” as well as to the winning teams. The individual winners were, in first place, Zach VanDyke of Michigan State University; in second place, Levi Johnson of Brigham Young University—Provo; and in third place, Matt Case of Alamance Community College. The top three superstars received scholarship money from the PLANET Academic Excellence Foundation. Brigham Young University— Idaho took first place in the overall competitive events, followed by Michigan State University in second place and California State Polytechnic University, Pomona in third. BYU—Idaho took home $5,000 from Stihl for winning first place. In addition to the competitive events, students met with company recruiters at the career fair, interacted with supplier companies, and got to test drive industry equipment throughout the event.